Jeremy Neumann | Graphic Designer -How to smoke ribs on a Weber Grill. At least my attempt to do so. Rub applied for resting for 1 hour. Along with some apple cider and apple vinegar. I use a chimney starter, and wait until the goals are glowing brown. This weekend I tried smoking ribs with a Weber grill with pretty good success. I wanted to perfect using a Weber grill for smoking, since I don't have a standalone smoker. I don't like the idea of an electric smoker, and in general count it as cheating. I find the best grill to have is a classic Weber One-Touch® GOLD 22.5" , and recently received one as an awesome birthday present. I decided to try some pork ribs and gathered my ingredients. I brined the ribs overnight in an apple cider salt solution. I used an aluminum pan and covered the pan with aluminum foil. After an overnight soak, I removed the ribs from the brine and pat dried the ribs. I then added a rub to the ribs and let them sit for an hour in foil. In the past I have made my own rub. For simplicity and to have a baseline, I picked some up at the store called Lil' Smokers Lil' Rub. I added some apple cider, apple vinegar, and salt to the rub while it rested and came to near room temperature. Not too warm, or too long—that will allow for nasty bacteria to form. Temperature is achieved closer to 2 hours in warm conditions. The ribs are ready for smoking. I setup my grill for indirect heat and a pan of water and apple cider. I have found that about 10 briquettes work best, maybe even less. The briquettes last for about 45 minutes, and you will need to add more through the process. Make sure to have your grate on correctly so that you can lift the side to place in more charcoal and wood chips. I used a chimney starter to light my briquettes and waited until they turned glowing orange. I also added my wood chips to a packet of foil and placed in the briquettes. I used hickory and orange wood chips. I soaked the chips in water for 2 hours before adding them to the fire. I also poured some of the water from the chips to the apple cider/water pan. Place goals and wood chips on one side, and your water solutions on the other. Once you have your briquettes and wood chips ready and water pan filled, place on top grate. Position your ribs so that they are on the opposite side of the fire over the water/apple cider pan. Doing this keeps the meat from not cooking too fast, and the water/apple cider adds some humidity so that the ribs do not dry out. Using the cider also infuses some flavor to the meat. 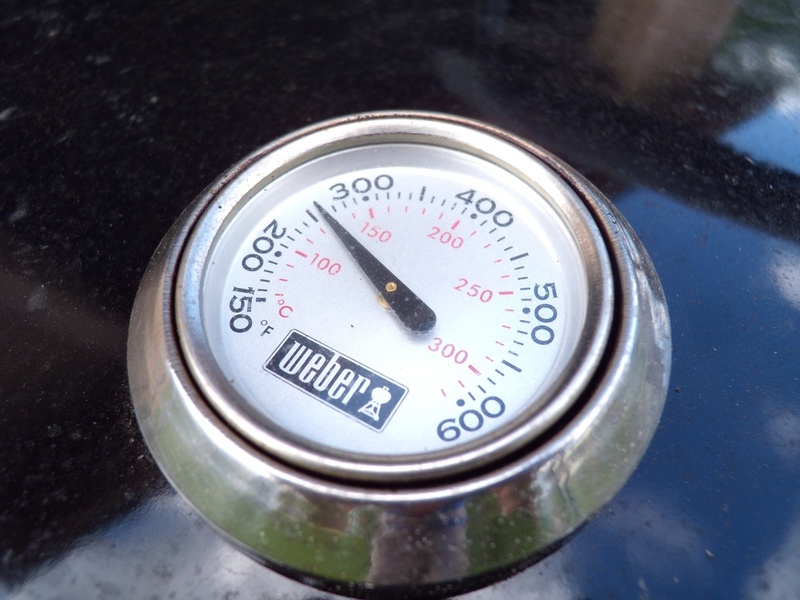 Once you have everything set, check your temperature and it should be somewhere around 250°. Get it right now so you don't have to keep checking the lid, as each time you open the lid you are losing precious smoke and heat. Place ribs over the water/apple juice solution. Now all there is to do is wait and keep an eye things. I cooked mine for almost 4 hours. Your time will vary and time depends on the desired smoke strength and temperature control. The longer smoking and lower temperature is better. My grill went up to 300°, so my ribs turned out chewier than I was intending. It's a waiting game. "Slow and Low," as they say. Make sure you don't leave the grill unattended. It's a good time to mow the lawn or clean out your garage, as I did. I checked on the ribs every 45 minutes to an hour, making sure to keep my briquettes consistent and plenty of wood chips, but not too many. Too much smoke will make the meat taste bitter. Make sure your smoke is white to bluish and never black or dark. Place your vent opposite of your fire. This allows for the smoke to be drawn across the meat. As you start near the 3 to 4 hour mark, start checking the doneness of the meat. Measure the internal temp of the ribs with a thermometer to check for doneness. You should reach at least 160°, just before the ribs are ready to be taken off the grill. I placed them in aluminum foil and poured in some apple cider too, and put a little sauce across the top. I then sealed the foil and put the ribs a bit closer to the coals so the foil would warm up. I then pulled the ribs and kept the foil sealed, and let the ribs rest for about 15 minutes on the kitchen counter. This allows for the juices to draw back into the meat. Shoot for 250. No more, maybe less if you intend to smoke longs. Now you can serve your ribs with your favorite sauce or without. Being from Kansas City I prefer Kansas City style BBQ sauce, and will usually use one of the local BBQ place's sauce. You can serve grilled corn or baked potatoes with your ribs. I hope to try to make my own BBQ sauce on my next grill outing. I find that I have some room for improvement. Less heat, and find a rub that I like. I plan to try again and this time using my own sauce. I might try try smoking a different type of meat as well. Thanks for reading. I used WEBER'S SMOKE™ book as a guidance along with various sources on the internet. How do you smoke your ribs? Post your findings in the comments below. Plating and ready to eat.